This 4/5 piece ceilidh band's danceable and foot-tapping sound is based on a varied range of instruments - melodeon, banjo, bouzouki, mandolin, acoustic guitar, electric guitar and bass, guaranteeing an enjoyable and fun-packed evening of jigs, reels, polkas, waltzes and hornpipes - a really good night for all generations ! They usually start the evening with easy dances that everyone can join in, maybe progressing to something a little more adventurous later in the evening if everybody feels like it. The emphasis is always on having a go and enjoyment. 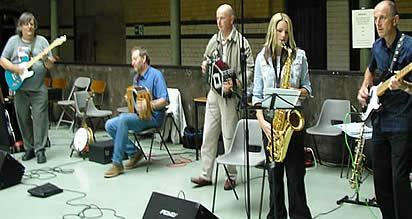 The band have played for ceilidhs at several major events including: Fylde Folk Festival, Accrington Clog and Dance Festival, Clitheroe Great Days of Folk, Otley Folk Festival, Maryport Shanty Festival, Southport Bothy Ceilidhs, Wiggince Ceilidhs, Golborne Phoenix Ceilidhs, BBC Music Live, Fallowfield Arts Festival, Preston Guild 1992.